A strong Ballinlough second team made light work of a hard working Slane side in this Junior D encounter, played in sunny conditions in Kilmainham on Sunday afternoon. The ‘Lough opened the scoring in the first minute when full forward Ken Rothwell split the posts with his usual pin point accuracy. Moments later, young, hard-working corner forward Adam Fox brilliantly found the back of the net after good work by Junior O’Reilly around the middle of the field. This one way traffic continued, and Ballinlough soon found themselves seven points to the good when speedy wing forward Paul Monaghan sprinted in to claim his sides second major score of the afternoon. Slane briefly rallied after this, registering their first scores of the afternoon, but struggled to maintain any momentum. 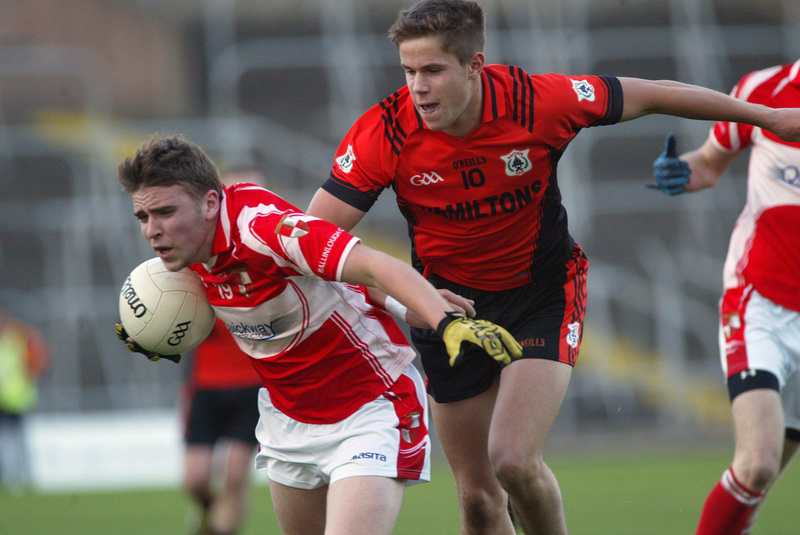 Kevin Beirne was controlling the middle of the field, and a lot of Ballinlough’s best attacks were built on his solid fielding ability throughout the contest. This dominance continued to show on the scoreboard, as Fox sneaked in for his second goal of the game, and Paddy Briody finished off another good move with an impressive point. James O’Higgins was also at his deadly best from placed balls, and converted some fine frees in the opening period. The industrious Oliver Brady brought the first half to a close with a powerful low drive to the back of the Slane net, to leave his side leading 4-06 to 1-03 at the change of ends. While Slane would have been hoping for a change of fortune in the second half, it turned out to be more of the same, as the ‘Reds continued to push ahead and extend their lead. Jonathan Montgomery Francis had been a real attacking threat from his wing back berth throughout the contest, and was rewarded early in the second period with a well taken point. Rothwell, O’Higgins, Briody and Fox all found their range with fine points, before the games last major score went in. A well struck 45 by O’Higgins was lofted into the area, dropping just short of the crossbar, but found its way to the back of the net thanks to intervention by substitute James Lydon. Ballinlough will be delighted with this eighteen point winning margin, and their strong team performance throughout the game. They will be hoping to go one step further in this competition this year after disappointingly losing the final in 2014.